Featuring a simple back-to-basics approach by LG, the Optimus One is a sturdy and affordable way to get into Android – especially since it's the first really cheap phone to come with Android 2.2. LG's been putting out touchscreen phones for a long time, but has yet to pull off a proper success in the amazingly competitive Android scene. Its Optimus GT540 was a poor attempt at making a stylish and original phone, and ultimately ruined by a terrible resistive touchscreen. Meanwhile, the GW620 was a perfectly adequate performer, but hardly thrilling when put up against, well, anything else. 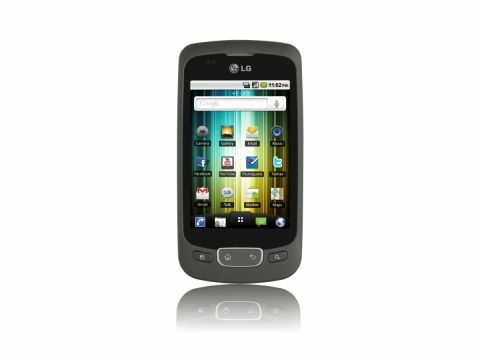 Rather than muscle in with a headline-grabbing, powerful new glamour model, it appears LG has decided to go back to basics with the Optimus One – a standard, no frills, 3.2-inch Android 2.2 smartphone for the everyman. Do we really need another lower-spec Android phone when the Orange San Franciso exists? First impressions of the Optimus One are rather good, despite the enthusiasm-sapping bland black slab design. The phone feels solid, pleasantly heavy and well made, with a slightly rubbery snap-on back cover giving you a little extra grip. Balanced in the hand, it's the perfect size and layout for one-handed use. The edge of the phone features a pleasant metallic strip, which is the visible edge of the phone's (very neat!) insides poking out. On this strip sits the volume up/down toggle, which is a solid, metallic rocker; a 3.5mm headphone jack and power button on the phone's top; and a micro USB connector on the bottom. The face buttons are large and easy to get at, but could do with being a little more solid. At least they're proper, physical buttons rather than the capacitive touch things found on the very similarly specced Samsung Galaxy i5800. LG has even cut out the icons and made them illuminate when pressed. Sadly, this is yet another Android phone where there's no optical or digital trackpad option to be found, so the Optimus One comes with the caveat that playing some games might be out of the question. Editing text is also that little bit tougher thanks to the lack of any sort of analogue input. Thankfully, the screen is capacitive, unlike that of LG's GT540, so a light press is enough to get things moving. It doesn't feel particularly solid or glassy beneath the finger, mind, but it does respond well to the touch, is bright and displays colours vividly.